Coffee is the world's 2nd most highly traded commodity. Many of the world's least reached people live in regions that are optimal for coffee bean production. Mai Thai Coffee from Thailand is using coffee to stimulate economic development for the people in Northern Thailand, where the proceeds help support orphans and at risk children. A Tucson coffee roaster, Arbuckle Coffee, has been instrumental in making Coffee with a Mission a success. We are excited to explore the possibilities of expanding the Coffee with a Mission concept to other areas of the world. We are currently working on a marketing plan for the U.S. to increase sales of Coffee with a Mission. If you, your church or someone you know would be interested in helping develop this plan, please contact Joe. We are partnering with a church called CCCG (Christian Cultural Center of Guatemala (translated)) and Pastor David Alvarez in Guatemala City. This church has over two hundred committed believers who are very active in ministry throughout the city and in rural villages throughout Guatemala. As we work with the church to form a Guatemalan company and start businesses in the area, the church will provide competent and trained workers, as well as contributing valuable leadership experience to the venture. Pastor Alvarez started the first paramedic service in Guatemala, and he and his immediate family have been involved in various aspects of Guatemalan business for many years. They will be a great resource to the new company. Starting in the spring of 2013, we began working with the La Mision School in Palencia, Guatemala. We were invited to join Feeding God's Children, a group from Knoxville, Tennessee, in ministering to the families in this community. Several families made proposals to start small businesses from an office supply and internet cafe to a pig farm. 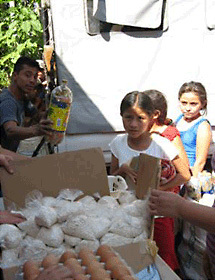 These projects are underway and we look forward to building new relationships in Guatemala. Read more on our Blog page. Opportunities have developed with a group that is involved in agricultural business in a central Asian country. Their specific need is for accounting and finance personnel. They also are seeking qualified engineers to assist in their work. Please contact us if you or someone you know would like more information about this project. We are working with individuals in a country in Central Asia to open a Fitness Center. The Fitness Center would serve locals and foreign workers in the country, providing a means to develop relationships, and possibly bring in related business opportunities as well.